Blue Hills, Yellow Tree brings together over three decades of works by Sally Saul, whose practice has become known for endearing and often humorous representations of humans, flora and fauna. The exhibition comprises sculptures created in Austin, Texas during the late 1980s and 1990s, and in New York City and Germantown, New York during the past twenty years. A selection of never-before-seen works on paper will also be included to provide an unprecedented overview of Saul’s oeuvre. As the first retrospective of the artist’s works, the exhibition interprets Saul’s surrounding world by paying homage to her rural upbringing and various homes around the United States. 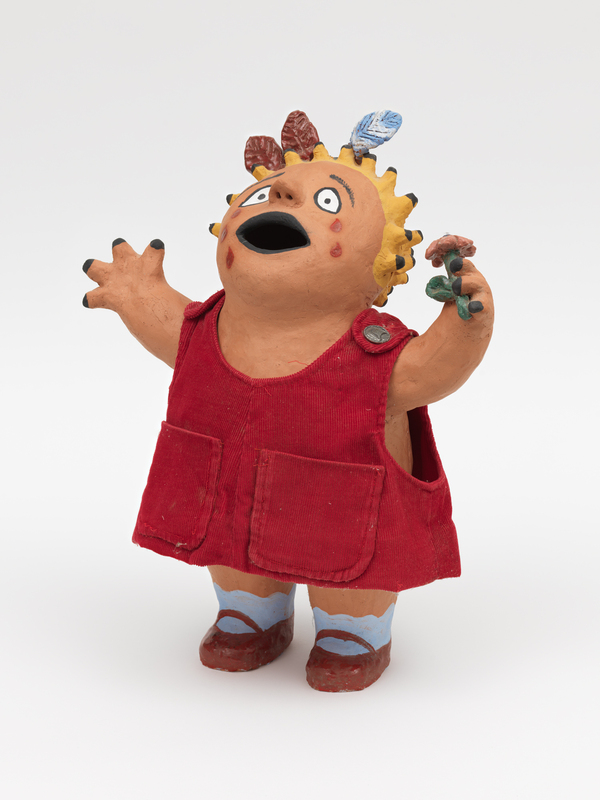 Throughout her decades-long ceramics practice, Saul has married the past and the present in a distinct way that is both playful and subversive. Born in 1946 in Albany, New York, the artist recalls the countryside as her earliest environment, where she was allowed to freely explore the nearby forest and lake. She moved westward to study literature in Colorado and California during the 1960s, and became acquainted with artists within the Bay Area visual arts movement in the early 1970s. Saul regards this introduction as the impetus for her interest in art making, adopting the Californian artists’ penchants for utilizing bright colors and drawing subject matters from day-to-day life. In 1981, Saul relocated to Austin, where the soon-to-be sculptor enrolled in her first ceramics programs. Many of these early works take form as busts of various figures, which render famous, fictional and real characters with lifelike expression. One particular series from 1996 pairs American presidents with notable women from concurrent time periods—for instance, Dwight D. Eisenhower with ecologist Rachel Carson, or Franklin D. Roosevelt with writer Gertrude Stein—as a way of contrasting feminine ingenuity against masculine power. At the same time, Saul’s works also serve as vignettes of her own personal life. Many sculptures depict the animals found within the pastures surrounding her home, while others reference lived memories such as the marriage to a beloved partner, the death of her mother, and the birth of her daughter. In this way, Saul merges introspective musings with an inner imagination defined by heart and humor. Sally Saul (b. 1946, Albany, NY) earned a BA from the University of Colorado in Boulder, CO and an MA in American Literature from San Francisco State University, San Francisco, CA. Practicing as a sculptor for over thirty years, Saul has participated in exhibitions at the Art Museum of West Virginia, Morgantown, WV; the Aldrich Contemporary Art Museum, Ridgefield, CT; Rachel Uffner Gallery, New York, NY; White Columns, New York, NY; the Woodstock Byrdcliffe Guild, Woodstock, NY; Lumber Room, Portland, OR; the Columbus Cultural Arts Center, Columbus, OH; and the Lawndale Art Center, Houston, TX; among many others. In 2018, the artist, with Peter Saul, co-curated the exhibition Out of Control at Venus Over Manhattan, New York, NY. Saul lives and works in Germantown, New York.